Do you know this child's first name? 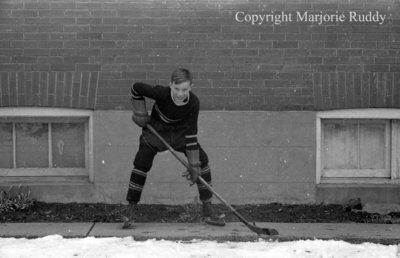 A black and white negative of an unidentified Lynde child posing outside in his hockey uniform and equipment. In this view a building is visible behind him. Unidentified Lynde Child, March 7, 1938, Marjorie Ruddy. Whitby Archives A2013_040_964D.